A professional accountant in April 2014, JSC "Center for training, retraining and advanced training of specialists of the financial system"
Certificates of professional development for 2012-2015. May 2015 - Сертификат, Tranining Programme on "Student Development, Service Learning, Entrepreneurship and Knowledge Transfer" for Almaty Management University, The Hong Kong Polytechnic University. July 2015 - Сертификат, "Современные тренды преподавания в высшей школе" в рамках летней школы по развитию профессиональных навыков и личностному росту преподавателей высшей учебных заведений СНГ, Иссык-Куль. September 2015 - Сертификат, "Жоғары білім беру саласындағы HR менеджменті: тәжірибесі және даму перспективалары", халықаралық ғылыми-практикалық конференциясы, Т.Рыскұлов атындағы Жаңа экономикалық университеті, Almaty. October 2015 - Certificate for the particaption at the IV Kazakh-German Logistics Forum "Kazakhstan: Bridge between Asia and Europe", Almaty. November 2015 - Сертификат, IX Международная научная конференция "Инновационное развитие и востребованность науки в современном Казахстане", Almaty. November 2015 - Сертификат, "Бизнес план: разработка и реализация инвестиционного проекта для нефинансовых менеджеров". Author of over 100 scientific publications, 2 textbooks, 3 monographs ("Industrial and technological development of Kazakhstan's economy in terms of globalization", 2007; "Regional processes of industrial modernization: international experience and Kazakhstan", 2009; "The technological development of the economy of Kazakhstan in conditions globalization: priorities and mechanisms ", 2012). Entered in the Golden Book of the youth of Kostanay region in the category "Science", 2008. Winner of the Club of Maecenas of Kostanai region in the category "Science", 2010. 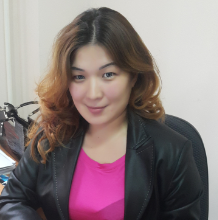 The holder of the grant of the Ministry of Education and Science of the Republic of Kazakhstan "The best teacher of high school in 2012", 2012.